It’s the 30th annual Festival International de Jazz de Montréal. MAGNET’s Mitch Myers translates the action. As I mentioned, the 30th Montreal International Jazz Festival is a sprawling operation of immense scope and volume. It’s not just jazz and it’s not just music, and the entire city gears up for the two-week celebration. The festival organizers have created their own jazz universe, including an art gallery, which is now showcasing the photographs of Herman Leonard—and the esteemed photographer was on hand for the opening. Born in 1923, Leonard is responsible for some of the most memorable, iconic photographs of famous artists like Frank Sinatra, Billie Holiday, Duke Ellington and countless others from the golden age of jazz (1940 through 1960). Leonard’s black-and-white shots have been reproduced all over the world, and his unique use of backlighting inspired numerous photographers. Herman has wonderful anecdotes about his encounters with these artists and is a model of discipline, integrity and joyous enthusiasm. If you aren’t familiar with his shot of saxophonist Dexter Gordon with cigarette smoke pluming around him, you don’t know jazz. Hats off to Herman! I caught a rehearsal by Quebec-based recording artist Patrick Watson. Patrick Watson is the name of the band, but the band is led by singer/musician Patrick Watson. They are popular up here, and I think they are supposed to be like a Canadian version of Radiohead. The band will be playing a big free outdoor concert here on Sunday and will be accompanied by a string section, horns, special guests and special effects. This is going be a mammoth spectacle, and the locals are going to be out in full force. Still, I wonder if these guys can break in America. Check out their new album, Wooden Arms, and see what you think. Just to keep things down to earth, I walked over to the Metropolis Ballroom to hear Susan Tedeschi and her band open for Chicago bluesman Buddy Guy. Tedeschi was in total command, singing in a strong, urgent voice and playing the heck out of her guitar. This is roots music, pure and simple, and her mix of blues, soul and gospel continues to evolve. Tedeschi’s band plays a solid version of Southern rock, but they all could loosen up a little bit more and have some fun with these great tunes. And Tedeschi should engage them even more. I only saw a half-hour of Guy, but I can pretty much tell you that there’s no other 73-year-old on the planet that can play blues like Buddy. He was wailing—I mean wailing—on the guitar and really knows how to please crowd: singing, screaming and picking the blues, doing shtick with the audience and letting his band strut their stuff. Tedeschi has been opening for Guy for years, and she should take a few more lessons from the master! 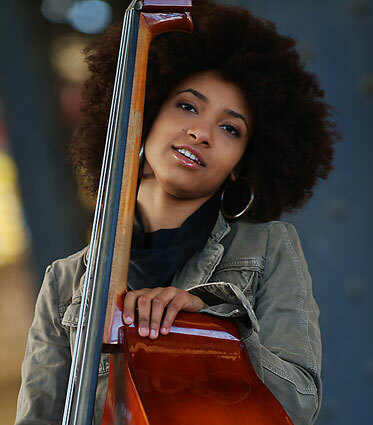 I left the Guy show to run back to the Gesù for a late-night gig by Esperanza Spalding (pictured). Spalding has a buzz going, as the singer/bassist has played with Prince and performed for President Obama. It’s not hard to see why. Spalding is a lovely, petite young woman with a huge afro-styled hairdo and a most charming demeanor. The Gesù gig was totally sold out, and Spalding had the crowd eating out of her hand. Literally dwarfed by her massive double-bass, Spalding scatted, crooned, jammed, joked and jived jazz in a soulful, modern style. While she treats her band with loving camaraderie, she’s clearly the star of the show. I can’t say that I loved the music, but Spalding’s winning enthusiasm is hard to resist and I understand the interest. Verdict: She’s a very promising young artist on her way to much wider appeal, and when her chops (both bass and voice) catch up with the rest of her act, look out!